Thank you for your sacrifice and your commitment! 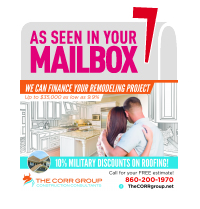 *Offer valid only for a GAF Lifetime Roofing System** installed on the home of an individual who is (a) in the active U.S. military; (b) a veteran of the U.S. military; or (c) a retiree of the U.S. military. Valid in the U.S. only. Must be installed between January 1, 2018, and December 31, 2018, by a GAF Master Elite or GAF Certified Contractor. Submission for rebate must be received within 8 weeks of installation date. Limit one rebate per GAF Lifetime Roofing System. Limit one rebate per qualifying individual. Void where prohibited, taxed, or restricted by law. GAF reserves the right to audit all redemption claims and improper redemption or use constitutes fraud. Go to gafrebatecenter.com for full terms and conditions. Check The Status Of Your Rebate! 1. Active U.S. military, veterans and retirees have a GAF Lifetime Roofing System* installed on your house by a GAF Master Elite or a GAF Certified Contractor between January 1, 2018 and December 31, 2018. 2. Complete the online rebate claim form in its entirety. A. A printed rebate form confirmation page. B. Proof of military service: Active Military - submit legible photocopies of a current LES (Leave and Earnings Statement must be dated within past 3 months). Veterans and retirees submit a DD Form 214. We ask that you black out your social security number as this information is not required. C. The Contractor's Invoice for your GAF Lifetime Roofing System* showing the date of installation and use of GAF Lifetime Shingles and at least three qualifying GAF accessories on your roof (four total products required). The name on the invoice must match the name of the qualifying individual submitting the claim. D3. Distributor Invoice showing purchase of GAF Lifetime Shingles and at least three (3) qualifying GAF accessories. 4. Allow 8 weeks from receipt of submission by mail for mailing of rebate check. If you choose to receive status updates, you will be provided with email updates about your claim. You can check the status of your rebate claim at www.TrackMyPromo.com. Please allow up to 3 days for your record to appear. Offer valid only for a GAF Lifetime Roofing System* installed on the home of an individual who is (a) in the active U.S. Military; (b) a veteran of the U.S. Military; or (c) a retiree of the U.S. Military. Valid in the U.S. Only. Must be installed between January 1, 2018 and December 31, 2018 by a GAF Master Elite or GAF Certified Contractor. Submission for rebate must be received within 8 weeks of installation date. Limit 1 rebate per person. Limit one rebate per Lifetime Roofing System*. Allow 8-10 weeks for shipment of your check or as otherwise required by law. GAF and ST&P Marketing Communications, Inc. are not responsible or lost, late, misdirected, incorrect, incomplete, illegible, damaged, or postage due mail/requests, or for technical errors that may affect the submission. receipt, or processing of rebate requests. Submissions received after deadline, incomplete submissions, illegible submissions, or submissions that do not comply with these terms will be rejected and will not be returned. No mechanically reproduced, forged, or altered documents or invoices will be accepted. Please keep a copy of submission for your records. GAF and ST&P Marketing Communications, Inc. reserve the right to audit all redemption claims and improper redemption or use constitutes fraud. GAF and ST&P Marketing Communications, Inc. are not responsible for printing errors or for any mail or rebate check lost by the U.S. Postal Service. To check the status of your rebate, go to trackmypromo.com. *A GAF Lifetime Roofing System consists of GAF Lifetime Shingles and at least three qualifying GAF accessories. For more information see gaf.com/lifetimeroofingsystem. Also see GAF Shingle & Accessory Ltd. Warranty for complete coverage and restrictions. The word "Lifetime" means as long as the original individual owner(s) of a single family detached residence [or the second owner(s) in certain circumstances] owns the property where the shingles and accessories are installed. For owners/structures not meeting above criteria, Lifetime coverage is not applicable. Lifetime Ltd. Warranty on accessories requires the use of at least 3 qualifying GAF accessories and the use of Lifetime shingles.